Since its development in the 1960s as a structured, short-term psychotherapy for depression, cognitive therapy has come of age. Today the approach is successfully applied in the treatment of a broad range of psychological disorders, an evolution reflected in the myriad titles now available. Regardless of the disorder, all these applications are based on core, underlying principles, which are clearly articulated in this volume. Providing readers with a solid foundation for practice, Cognitive Therapy: Basics and Beyond delineates the fundamental building blocks of cognitive conceptualization and treatment. Written in a clear, step-by-step style, this text helps therapists sharpen their conceptualization skills, plan more effective treatment, expand their repertoire of techniques, and trouble-shoot difficulties. Throughout the volume, the author offers clinical examples and transcripts drawn from one patient's treatment to illuminate the narrative and illustrate cognitive therapy in action. Introductory chapters describe how to conceptualize clients according to the cognitive model, plan and conduct the first session, identify initial problems and goals, and structure therapy within and across sessions. Then the basic steps for conducting cognitive therapy are presented, with specific instruction on how to identify, evaluate, and respond to a client's automatic thoughts. Effective strategies for modifying underlying assumptions and core beliefs are also explicated. Methods for increasing homework compliance, preparing for termination, and preventing relapse are laid out. Even experienced cognitive therapists will find new strategies and insights in chapters on planning treatment, diagnosing problems, using imagery, and bringing about behavioral change. In addition to numerous practical suggestions, this volume features a variety of sample patient worksheets and appendices that detail resource materials and reading lists for both the practitioner and the client. A final chapter offers guidance in progressing as a cognitive therapist. An important resource for any therapist's shelf, Cognitive Therapy: Basics and Beyond is necessary reading for the practitioner or student new to cognitive therapy who wants to learn about this tested approach, and for the clinician already practicing cognitive therapy who wants to learn the cutting-edge strategies of conceptualization and treatment. As a working adult, finishing my second Master's in Clinical Psych...and having NEVER acquired the art of speaking in psycho babble, I can say that Beck writes in PLAIN, UNDERSTANDABLE ENGLISH (gee, that's a novel idea!!!!). The older I get, the LESS impressed I become with academia and the more desirous I become of those who are able to communicate complex truth's in understandable fashion. This is an excellent book for both clients and therapists. It presents cognitive therapy concepts without jargon in a straightforward and practical manner. This text is well-organized and covers all the most important points of cognitive therapy. It also does go well beyond the basics and makes a useful reference book. I have read a lot of books on cognitive therapy and this is my favorite. It is dense, yet very readable without a lot of unnecessary detail. This text has two clear applications. First, it is a very good summary of techniques for the clinician, with multiple examples of tools available to conduct and reinforce CBT sessions and to maintain close patient involvement with accelerated self-management over time. Second, for intelligent, well informed patients (of well-informed family and friends) it can serve as design for some very useful self-management tools (or, for family / friends, a way to develop support tools). While I would not recommend this book for a lot of patients, there are certainly those who are motivated and will quickly adapt much of what Beck covers to supplement sessions with their therapist. One of the key aspects to optimal CBT is to address automatic negative thoughts early, and to work on ways to manage them and replace them with positive automatic thoughts. 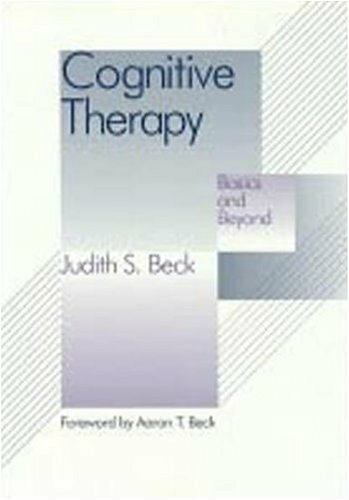 Judith Beck outlines this process and clarifies the stages of a typical therapy course in a manner that lays a foundation and builds of the work to be completed. Perhaps, for the clinician, the greatest value lies deeper in the book where several approaches are discussed about techniques to consider when the earlier approaches have failed or yielded questionable gains. I purchased this book as a precursor to my, just getting started, undergraduate education in Psychology. This book provided me with a means to both understand cognitive therapy and its application. In fact, I do not think it gets any more rudimentary then this, but with that said, it offers practical information beyond just the basics. The book is gracefully easy to read and will keep you interested and actively challenges you to participate, using yourself as a focus to understanding the application of therapy, by asking you to challenge your own core and intermediate beliefs and automatic thoughts. While I'm sure cognitive therapy could be far more complex, if one sought to uncover its deepest understanding, this book offers a very practical guide for even the experts! Maybe I'm not qualified to say that, but it was a thought that crossed my mind numerous times while reading. "If I can understand this, without much training or practical experience, an expert on the subject matter could easily use it to guide and enhance their own application of cognitive therapy."